This article is about the Asian deity in general. For Yama in Hinduism, see Yama (Hinduism). For Yama in Buddhism, see Yama (Buddhism). For other uses, see Yama (disambiguation). Yama ( listen (help·info)) or Yamarāja is a god of death, the south direction, and the underworld, belonging to an early stratum of Rigvedic Hindu deities. In Sanskrit, his name can be interpreted to mean "twin". In the Zend-Avesta of Zoroastrianism, he is called "Yima". Sculpture of the dikpala Yama. According to the Vishnu Purana, Yama is the son of sun-god Surya and Sandhya, the daughter of Vishvakarma. Yama is the brother of Sraddhadeva Manu and of his older sister Yami, which Horace Hayman Wilson indicates to mean the Yamuna. According to the Vedas, Yama is said to have been the first mortal who died. By virtue of precedence, he became the ruler of the departed, and is called "Lord of the Pitrs". Mentioned in the Pāli Canon of Theravada Buddhism, Yama subsequently entered Buddhist mythology in East Asia, Southeast Asia and Sri Lanka as a Dharmapala under various transliterations. He is otherwise also called as "Dharmaraja". Yama is revered in Tibet as the Lord of Death and as a guardian of spiritual practice. In Hinduism, Yama is the lokapala ("Guardian of the Directions") of the south and the son of Surya. Three hymns (10, 14, and 35) in the 10th book of the Rig Veda are addressed to him. In Puranas, Yama is described as having four arms, protruding fangs, and complexion of storm clouds with a wrathful expression; surrounded by a garland of flames; dressed in red, yellow, or blue garments; holding a noose and a mace or sword; and riding a water-buffalo. He wields a noose with which he seizes the lives of people who are about to die. Yama is the son of Surya and Saranyu. He is the twin brother of Yami, brother of Shraddhadeva Manu and the step brother of Shani. His wife was Goddess Dhumorna and his son was Katila. There is a temple dedicated to yama at Thiruchitrambalam in the Thanjavur district of Tamil Nadu, India better known as Yama Dharmaraja Temple . In Buddhism, Yama (Sanskrit: यम) is a dharmapala, a wrathful god or the Enlightened Protector of Buddhism that is considered worldly, said to judge the dead and preside over the Narakas ("Hell" or "Purgatory") and the cycle of rebirth. The Buddhist Yama has, however, developed different myths and different functions from the Hindu deity. 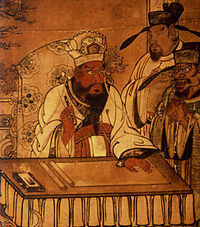 In Pali Canon Buddhist myths, Yama takes those who have mistreated elders, holy spirits, or their parents when they die. Contrary though, in the Majjhima Nikaya commentary by Buddhagosa, Yama is a vimānapeta – a preta with occasional suffering. In other parts of Buddhism, Yama's main duty is to watch over purgatorial aspects of Hell (the underworld), and has no relation to rebirth. His sole purpose is to maintain the relationships between spirits that pass through the ten courts, similar to Yama's representation in several Chinese religions. Yama's Court and Hell. The Blue figure is Yama with his twin sister Yami and Chitragupta. The idea of Naraka in Sikhism is like the idea of Hell. One's soul, however, is confined to 8.4 million life cycles before taking birth as a human, the point of human life being one where one attains salvation, the salvation being sach khand. The idea of khand comes in multiple levels of such heavens, the highest being merging with God as one. The idea of Hell comes in multiple levels, and hell itself can manifest within human life itself. The Sikh idea of hell is where one is apart from naama and the Guru's charana (God's lotus feet (abode)). Without naama one is damned. Naama is believed to be a direct deliverance by God to humanity in the form of Guru Nanak. A Sikh is hence required to take the Amrit (holy nectar/water) from gurubani, panj pyare (khanda da pahul) to come closer to naama. A true Sikh of the Gurus has the Guru himself manifest and takes that person into sach khand. In the Jātakas the Narakas are mentioned as Yama's abode (referred to in Pali as Yamakkhaya, Yamanivesana, Yamasādana, etc). It is also noted that all of Samsāra is subject to Yama's rule, and escape from samsāra means escape from Yama's influence. The Vetaranī River is said to form the boundary of Yama's kingdom. Elsewhere, it is referred to as consisting of Ussadaniraya (Pali; Sanskrit: Ussadanaraka), the four woeful planes, or the preta realm. Mandarin Diyu, Japanese Jigoku, Korean Jiok, Vietnamese Địa ngục literally "earth prison", is the realm of the dead or "hell" in Chinese mythology and Japanese mythology. It is based upon the Buddhist concept of Naraka combined with local afterlife beliefs. Incorporating ideas from Taoism and Buddhism as well as traditional religion in China, Di Yu is a kind of purgatory place which serves not only to punish but also to renew spirits ready for their next incarnation. This is interchangeable with the concept of Naraka. listen (help·info), Great King Enma) judges souls in Meido, the kingdom of the waiting dead. Those deemed too horrible are sent to Jigoku, a land more comparable to the Christian hell. It is a land of eternal toil and punishment. Those of middle note remain in meido for a period awaiting reincarnation. Others, of high note, become honored ancestors, watching over their descendants. In the Buddhism of the Far East, Yama is one of the twelve Devas, as guardian deities, who are found in or around Buddhist shrines (Jūni-ten, 十二天). In Japan, he has been called "Enma-Ten". He joins these other eleven Devas of Buddhism, found in Japan and other parts of southeast Asia: Indra (Taishaku-ten), Agni (Ka-ten), Yama (Emma-ten), Nirrti (Rasetsu-ten), Vayu (Fu-ten), Ishana (Ishana-ten), Kubera (Tamon-ten), Varuna (Sui-ten) Brahma (Bon-ten), Prithvi (Chi-ten), Surya (Nit-ten), Chandra (Gat-ten). ^ Ancient History Encyclopedia. Yama. ^ Puhvel, Jaan (1989). Comparative Mythology. Baltimore and London: Johns Hopkins University Press. pp. 285–286. ISBN 978-0801839382. ^ Effectuation of Shani Adoration pg. 10–15. ^ "Rig Veda Book 10 Hymn 14 Yama". Sacred-Texts. Retrieved 8 July 2017. ^ Warrier, Shrikala (20 December 2014). Kamandalu: The Seven Sacred Rivers of Hinduism. Mayur University London; First edition. p. 291. ISBN 978-0953567973. ^ "How much do you know about Yamaraj – The Hindu God of Death?". www.speakingtree.in. Retrieved 7 January 2018. ^ ""Buddhist Protectors, Wisdom Deities (Dharmapala)."". Himalayan Art Resources. Retrieved 8 March 2018. ^ Guru, Shri Bhagavatanda (2015). A Brief History Of The Immortals Of Non-Hindu Civilizations. Notion Press. ISBN 1329586077. ^ a b Teiser, Stephen F. (1996). "The Cosmology of the Festival". The Ghost Festival in Medieval China. Princeton University Press. ISBN 0691026777. ^ Chaudhuri, Saroj Kumar (2003). Hindu Gods and Goddesses in Japan. Vedams. ISBN 8179360091. ^ "Columbia Undegraduate Net Impact". www.columbia.edu. Retrieved 7 January 2018. ^ "Yama". Buddhist Dictionary of Pali Proper Names. Retrieved 7 February 2019. ^ "Indian Myth and Legend: Chapter III. Yama, the First Man, and King of the Dead". sacred-texts.com. ^ Kuz'Mina, Elena (2007). The Origin of the Indo-Iranians. Leiden, The Netherlands; Boston : Brill. p. 35. ISBN 9789004160545. Retrieved 27 January 2016.